I tend to spend most of my time dabbling with 1/48 scale aircraft. 1/48 is more or less the “standard” scale for World War II subjects and boasts far and away the greatest selection of kits, aftermarket goodies, decals and so on. 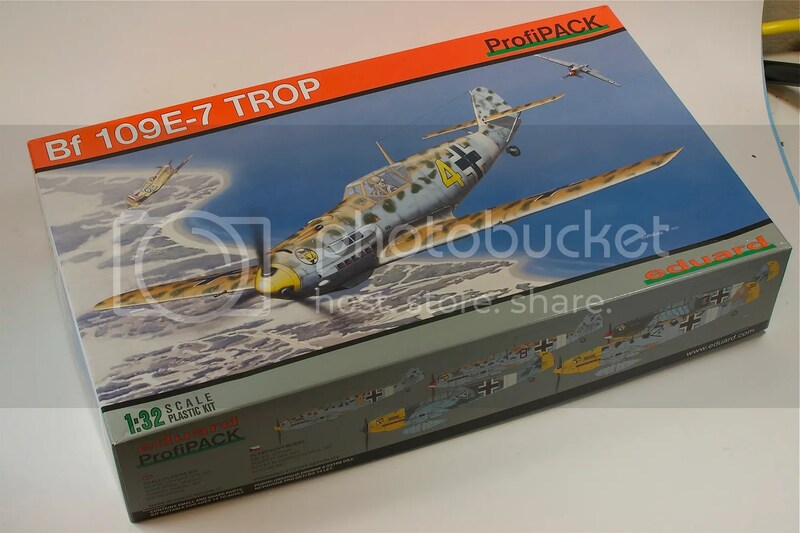 But lately I’ve been building a respectable stash of 1/32 aircraft, and I’ve been itching to play with the larger scale, so I decided to pull Eduard’s Bf 109E-7 Trop down off the shelf. 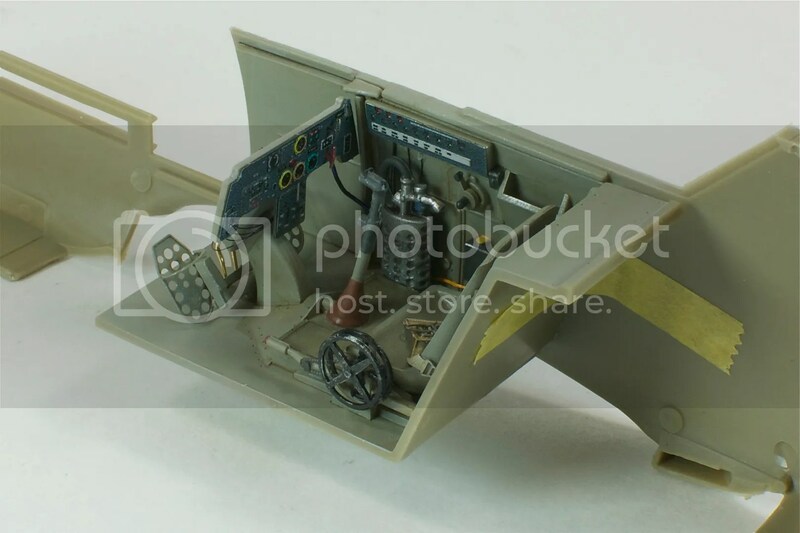 If there’s one thing I’ve been looking forward to tackling in a 1/32 scale aircraft, it’s the cockpit. 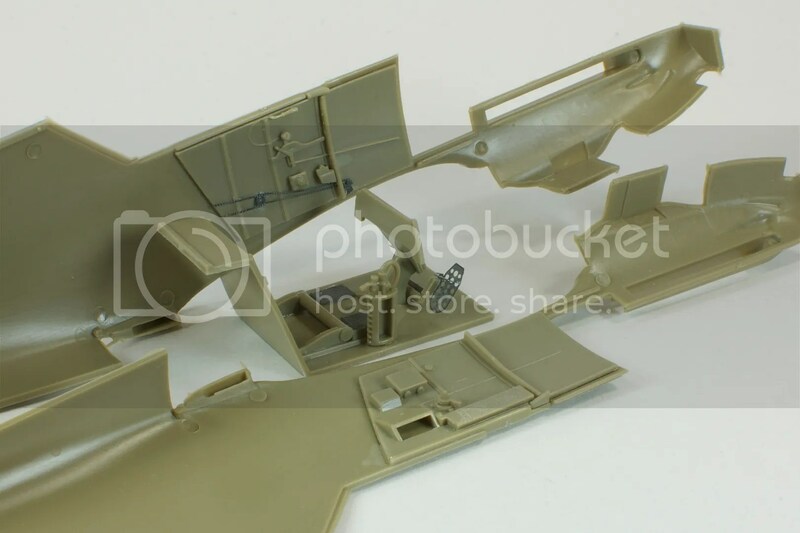 1/32 kits are 50% larger than their 1/48 equivalents, which means all those fiddly little details found in the cockpits are also, you guessed it, 5o% larger. In the case of Eduard’s E-7, these details are represented in a mix of styrene and photo etched parts. I started the build by assembling the bulk of the cockpit – namely the seat risers, lower instrument backing, rudder pedals, and attaching the cockpit sidewalls to the fuselage. The styrene was attached using Tenax 7R, the PE parts using dots of CA applied with toothpicks. These were then primed and painted with Model Master RLM 02 Grau (German for gray). Starting around mid-war, the Luftwaffe switched to the darker RLM 66 gray as their standard cockpit color, so encountering this sandy-brownish gray was something of a surprise. After the base color was applied, I did a general dry-brushing with Model Master Aluminum, then went about applying the color PE bits. 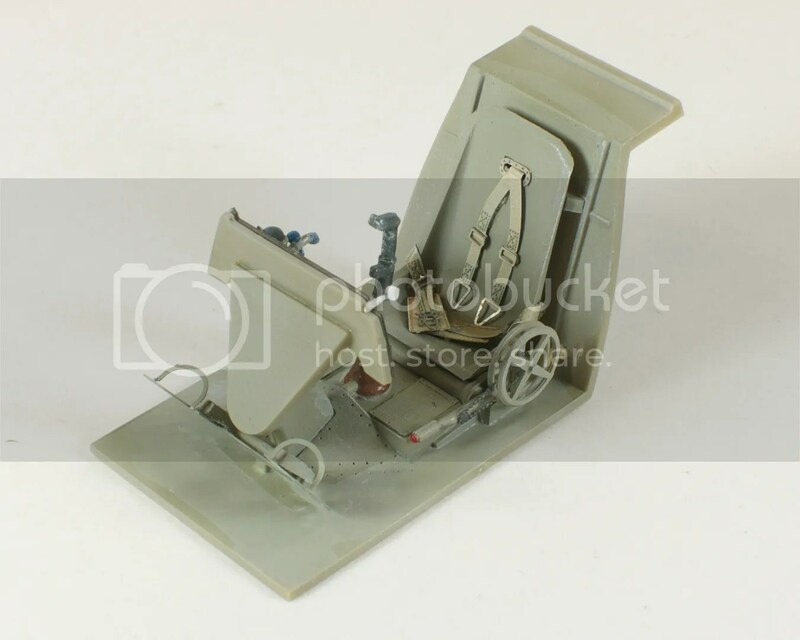 After fighting Eduard’s PE seatbelts on a few 1/48 aircraft, I have to admit, they’re a pleasure in the larger 1/32 scale. The lower instrument panel looks pretty great, too. I secured the dial backing to the panel face with Future, then used dots of CA to attach the additional panel faceplates. At this point I made an excursion to King’s Hobby and picked up a handy reference book on the Bf 109E. This armed with actual, real examples of a 109 cockpit, I returned to my scale version, painted it up properly, and added some wiring detail where appropriate. I then hit the entire cockpit with a thin wash of raw umber artist oil to dirty the place up a bit, and viola! 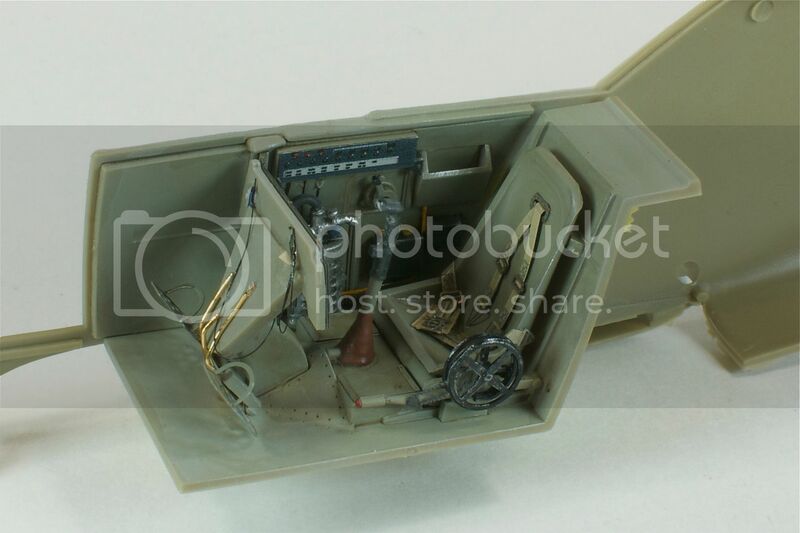 Overall, the cockpit is way more spacious to work in than your typical 1/48 aircraft. Many of the molded and etched details are very strong, but a few of them feel somewhat clumsy. The control stick, in particular, appears way too chunky. That and the cockpit should be “busier”. 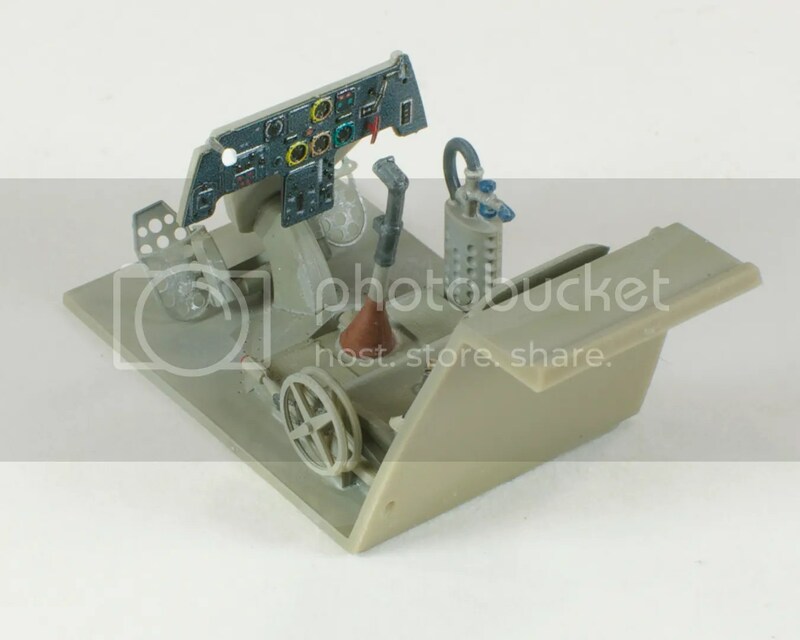 If I were building another one of these, I’d seriously consider springing for the Aires cockpit set. It’s looking good! I would enjoy some 1/32 kits, but I just don’t have the display room at the moment. I’m sure the larger size dose help tremendously with detailing. Two questions for ya. How do you bend your PE? I’ve seen special tools that cost a lot, but is it manageable to use small pliers and such? Also, why did you use future to attach instrument panel parts instead of CA? Hey Aaron – good to see you back and commenting! I agree with you about the size of 1/32 kits. The scale and presence are awesome, but they definitely present a display challenge. That said, the 109 is a pretty small aircraft, and (barely) fits in my 11″ deep shelves. I’d guess it probably occupies about as much space as a 1/48 Mosquito or so. As far as bending PE, I usually use two sets of pliers to get the job done. Many of Eduard’s PE pieces have bend lines already, so if you can align a set of pliers right along those, it’s easy to get it right. For smaller pieces (the throttle quadrant on my just-completed P-47, for example), I’ll trap the part under something flat and straight (piece of glass, metal straight-edge, etc), then use an xacto to “flip” the part up. I honestly don’t use Future for very many attachments, but for the instrument panel and panel backing, I prefer because 1) there’s no risk of CA creeping in to the dials, 2) more time to work with the alignment and 3) with a surface that broad and flat, Future adheres quite well. OOps,I pressed something wrong & it vanished. I’ll just be less loquatious this time.I was thanking you for your help today,commenting on your informative blog & asking about your Sherman update.I’ve always wanted to do what you’ve done & what I’ve read about many times.I’m referring tothe primer,flat black pre shading then 1st base coat. The reason I’ve never tried that method is that,After all that paint being laid down,don’t you lose an appreciable amount of the finer surface details,I.E. welding runs,casting #’s, etc. ? Also,I somehow missed the article you were referring to mentioning using “Dunklegrau” for drybrushing,But other than where the sponson & top meat, where else did you drybrush with that color on the M-4 ? Finally,I loved the brushes you showd for down-streaks.Where’d you get them ? I’m hoping they’re available at my local “Michaels” craft store.I completely understand if you don’t have time to respond to my Que.’s.Family life is all consuming as it should be. I blinked twice & my own son is suddenly approacng 33 [ & I’m only 53 !!! ].Thank’s again Doog. keith R. P.S. I’ve always had a huge fan of the PanzerIV & felt it got nowhere near enough credit in the static Modeling/Diorama world. Hey Keith – glad you’re enjoying the blog! 2 – I drybrushed the entire kit with dunkelgrau…it’s most evident along the edges, but it’s there everywhere. Next time, honestly, I think I’ll lay off a bit on the turret, since I think I overdid it a bit there. 3 – I got the brushes at Hobby Lobby…though they may well be available at Michaels as well. To be honest, I don’t go into Michaels very often, as its where I bought most of my modeling stuff growing up, and seeing the current state of their model “section” is just too painful.